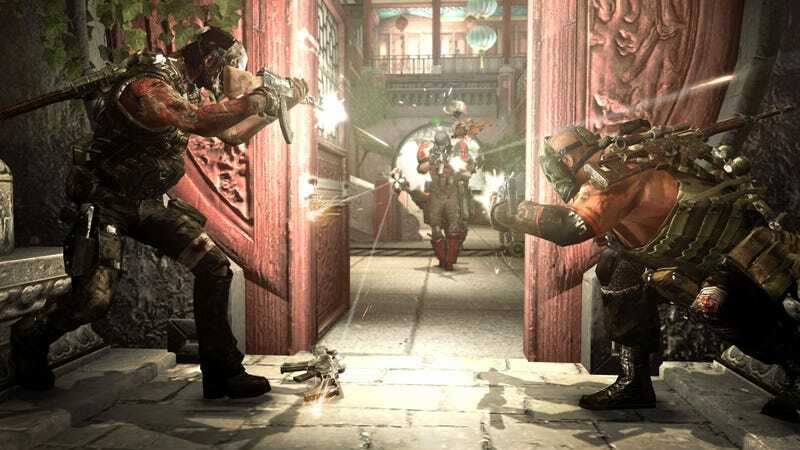 Europe: Army Of Two Was "Ridiculous, Tasteless"
EA Montreal are currently at work on an Army of Two sequel, and as part of that work, have been looking at what was wrong with the first game. Like how Europeans hated it. "We had this whole market in the US that thought the tone was cool, but in Europe everyone thought it was ridiculous and tasteless and a bunch of frat guys running around", EA Montreal's Reid Schneider told GI.biz. Their solution? Let players tailor the tone of the sequel to the way they're playing it. "One of the things we learned was that we're never going to be able to please both. So the way you interact with your partner and decisions you make – if you're doing a lot of fist bumps – these influence the tone and the dialogue of your character. If your taking it on a more serious level then the game reacts seriously." As neither an American nor a European, I feel I'm qualified to say that if you're skimping on the fist bumps, you're missing the point.